The alarm went off dark and early on Wednesday morning, just like any other day. Except that we were staying with Andrew's mum, and the alarm was to allow us to shower & grab breakfast before setting out for the trail. We were both ready long before 6:30am, when his sister was to pick us up, so we read snippets of the Seattle paper and finished off the bowl of blueberries. Last newspaper, last fresh fruit, last showers for a while. We all piled in the car and headed east, taking advantage of good cell service to catch up on a few last emails. Once we hit Hwy 20 the signal became spotty and we switched our phones to airplane mode, where they'll stay for much of the next several months. 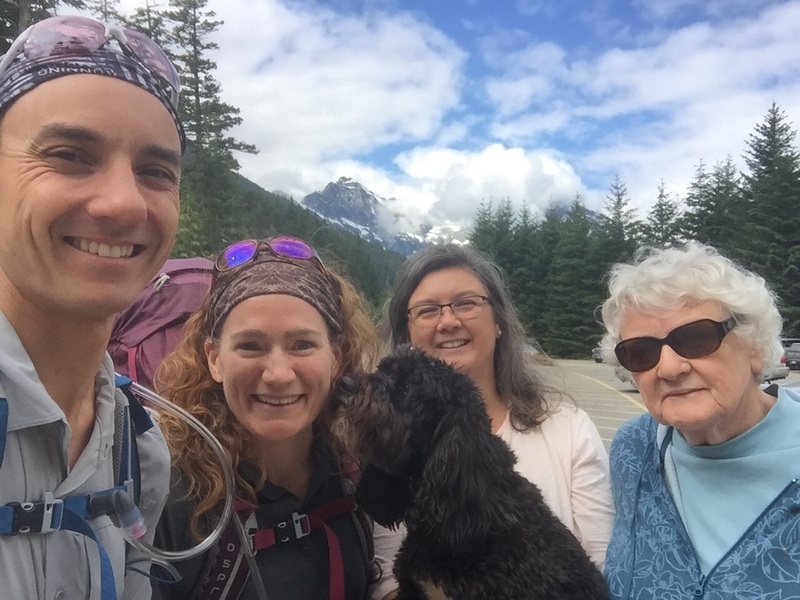 Andrew's mum, sister, & her dog drove us all the way to Ross Lake to start our journey. Huge thanks! Fun Fact: Because so many people asked, we finally weighed our backpacks before leaving Riverside. Loaded with 2L of water apiece, and all of our gear, food, and fuel for the first stint from Ross Lake to Rainy Pass (but not clothes worn), each of our packs were between 45-50#. This is probably as heavy as they'll ever be on the trip, since it includes snow gear and is for a long-ish 8-day stretch. We arrived at Ross Lake Dam right on target, with time to make final pack adjustments and take some pictures before saying good-bye to Andrew's fam and a huge thanks for supporting our journey. We'll see them again in a week at Rainy Pass, and a few more times through WA. It's an easy 1 mile walk down to the dock, where we called for our water taxi. And like that, the trip had begun. The day was overcast and a cool 55F, and the lake was quiet mid-week. After a 30 minute boat ride we unloaded our packs at Devil's Junction and started hiking. It felt like any other backpacking trip, rather than the momentous start of a 4-month thru-hike. We both agreed that reality would probably set in once we reached the PCT proper. For now, we just settled into our "bonus miles" and enjoyed being in the wilderness together. The water taxi with a view. We're about to start hiking! It's a steady climb to Dry Creek Pass but the weather was perfect for hiking, with constantly changing clouds and occasional patches of sun. We enjoyed views of dramatic Jack Mtn and Nohokomeen glacier to the south, and a riot of wildflowers at our feet. With just a few brief stops we reached Devil's Dome in the early afternoon and crossed our first large patches of snow. It was all fairly low-angle, with a soft surface this late in the day, so we didn't need any gear but our poles. We spent a little time enjoying the 360-degree views and generally perfect day from this stunning spot. Beyond the dome the trail traverses high along a rocky slope then follows a spectacular narrow ridge covered in wildflowers and edged by a snow cornice. Although we'd been on the trail before, it was late August with no snow and fewer flowers in bloom, and we couldn't help but stopping to take more pictures. Finally we settled back into a steady hiking pace and covered the final miles to Devil's Pass.There are nice campsites there but we wanted to get a little closer to the PCT so we continued along into the next basin, where we knew there was a small campsite near a stream. We hadn't seen anybody on the trail all day, and were happy to find our campsite empty aside from some patches of snow. We settled in and were asleep before it even got completely dark outside. 13+ bonus miles down, only ~23 more to go. Day 2 was cloudy and grey from the start, and it looked like rain. With plenty of sleep, we packed up early and were hiking by around 7am. The terrain isn't particularly difficult but the trail was overgrown in this section, with intermittent large blow downs and plenty of mosquitos. My energy was low and the weather didn't help much. We crossed a few sweet meadows and there's a nice view from Sky Pilot Pass, but for the most part we were in dense forest with intermittent light rain or thick mist. Those 6.4 miles to the PCT seemed to take forever. We eventually reached the last small rise up to Holman Pass and when we saw the PCT signs at the junction we both broke out in huge smiles. Despite the weather and my doldrums, we agreed on a goal of Hopkins Lake for the night so we would be well-positioned for a day-hike to the border on Day 3. The PCT is wider with more consistent tread and better grading than the Devil's Ridge trail. We made decent progress north even with several breaks for my feet which were bothering me more than usual. The trail generally follows a high traverse along forested slopes, but with intermittent views of steep and snowy crags. We broke out of the forest to cross a wide, shallow basin covered in brilliant green grass and dotted with wildflowers. The grey sky and low fog occasionally teased us with glimpses of Rock Pass at the far end of the basin, and its dark craggy rock was ominous in the swirling mist. Rock is the first (and steepest) of 3 passes typically covered by snow in early season and I was a bit nervous about what we would find on its north side. As we approached closer we passed a trio of girls who had already reached the border and were headed south towards Mexico, and this buoyed my energy considerably. We reached the pass to find a large snowfield covering the trail and looked over the edge at the steep north face below. Consulting our map, we realized we could traverse the first large snowfield at its lower-angled edge then would pick up a long series of switchbacks with only a few short (albeit steep) patches of snow to cross before continuing a long traverse across a scree-filled but generally snow-free slope towards Woody Pass. We navigated the descent easily in light but steady rain (using ice axes for safety but leaving our crampons strapped to our packs), and stopped below the snow to put on warm layers. The rest of that afternoon was more of the same. Grey, damp, and chilly. We found less snow than expected over Woody Pass, posing no technical challenge. We saw a few more SOBO thru-hikers and had fantastic though fleeting views of the surrounding mountains whenever the fog cooperated. I was plagued by progressive foot pain through the afternoon which was frustrating to say the least, especially this early in the trip. For some good news, I was elated to discover that I had mis-read the topo map and our final "climb" up something called Devil's Stairway was actually a descent! After this exposed though otherwise unremarkable set of rocky switchbacks we reached the largest, steepest, and most exposed snowfields of the day, which we carefully descended to reach the ridge above Hopkins Lake. The lake is small, but a real beauty, with its deep green waters surrounded by an impossibly high and steep dark rock face covered in patches of snow and brilliant green vegetation. Andrew pointed out one area that looked like Greenland and I had to have him clarify whether he meant the country's shape, or terrain. Both, really. We descended an interminable number (for sore feet) of switchbacks to the lake, where we found ourselves alone and set up our tent just in time for rain to start in earnest. Day 3 started with grey skies once again, but we were only day-hiking and headed to Canada. Yesterday's low energy and foot pain were both a distant memory and even light rain as we put a few things in our packs couldn't dampen our collective mood. It is just 6 miles to the border from Hopkins Lake, and we didn't waste any time. We passed 5 thru-hikers before Castle Pass (where the 3 Fools trail comes in from Ross Lake), then settled into a period of solitude. The first mile or so north of Castle Pass is overgrown, and it wasn't long before we were soaked from pushing through the wet vegetation. We had periods of light rain, but not enough to make our jackets wet. Our pants and shoes, on the other hand, looked as though we had gone for a swim. We passed one final pair of thru-hikers and shared a grimace over the sodden bushwhacking. The final few miles were a steady descent on a forested trail with just a few blowdowns to navigate. The fog, mist, and clouds continued and we remarked that every picture we've seen of the northern terminus is grey, wet, or both - neither of us has ever seen one in brilliant sun. Hmmmm. I spotted the monument first, and we hurried to reach the small clearing that contains the border monument and the PCT northern terminus marker. And we had a patch of sun! It only lasted a few minutes, but we both saw it. We took several pictures - there's a conveniently placed stump some distance away from the terminus marker perfect for placing a camera. We wrung out our socks, had a snack, signed the trail register, and generally basked in the fact that now we are officially on a SOBO PCT thru-hike. It was a magical feeling to reach that northern terminus. The bonus miles are over, let the real journey begin.